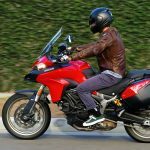 Yes, we just included the new 2017 Ducati Multistrada 950 in a little three-bike comparison test last week, where it finished less than one percentage point away from the win. Since then, I’ve had the chance to spend more time on the bike in my native habitat, and I can now reconfirm how right I was in the first place! As usual. Mostly. The 937cc Testastretta 11-degree V-Twin is a tremendously sweet “little” motor to use, and if we could travel back in time and run it against a Raymond Roche Ducati 888 (which at the time was “big”), I think the two would be right on par with each other – right at 100 smooth and progressive horses at the rear wheel. 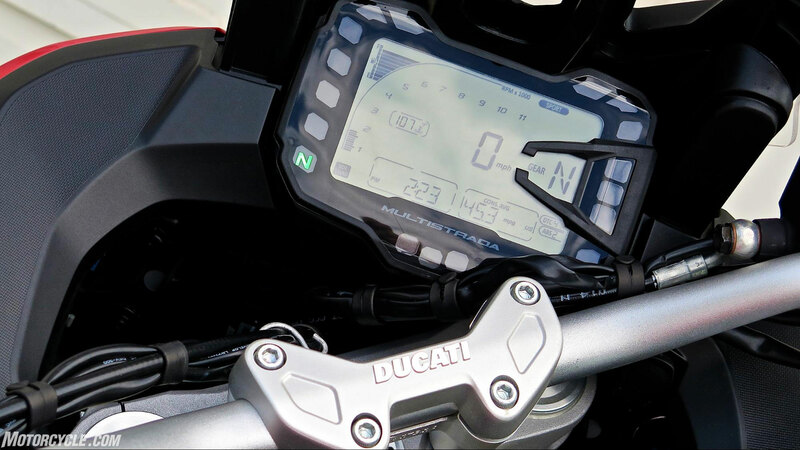 The gearbox in the new bike is less positive than the old one, but the light-pull slip/assist clutch means you don’t mind if you have to shift twice now and then. At 2700 miles, the gearbox should be getting better but really isn’t. It’s tough to find neutral from first or second. It shifts best when you’re wearing heavy boots. It looks like an ADV bike, I guess, but it’s really a sporty standard with a 19-inch front wheel that goes pretty well down dirt roads too. 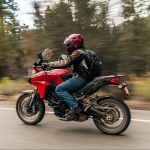 The sit-up ergonomics are what made adventure bikes so popular, and in that regard the new Multi is head and shoulders above the old 888 quite literally. 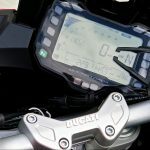 This Ducati is supremely comfortable for a range of riders, with a nice calm cockpit behind the one-hand adjustable windscreen that makes loping along at 80 mph an exercise in serenity. It’s also an exercise in heat management; the Multi’s not as good at it as some others. It’s not the worst offender, but it does heat up the rider’s feet and fronts of the lower legs more than most. Other less-than-optimal details, but only because you’ve ridden the 1200 Multistradas, include what now looks like an old video game of an LCD display instrument panel. It’s nice to have four different ride modes on display up there in the right upper corner, but the font is too small even for people with good eyesight. 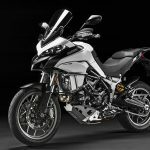 Sport, Enduro and Urban would be enough for the 937; each one automatically adjusts the three levels of ABS and eight levels of Ducati Traction Control to suit. You toggle between them using the turn-signal switch, which means the display is flashing all the time if you’re in the subconscious habit of cancelling your turn signals. 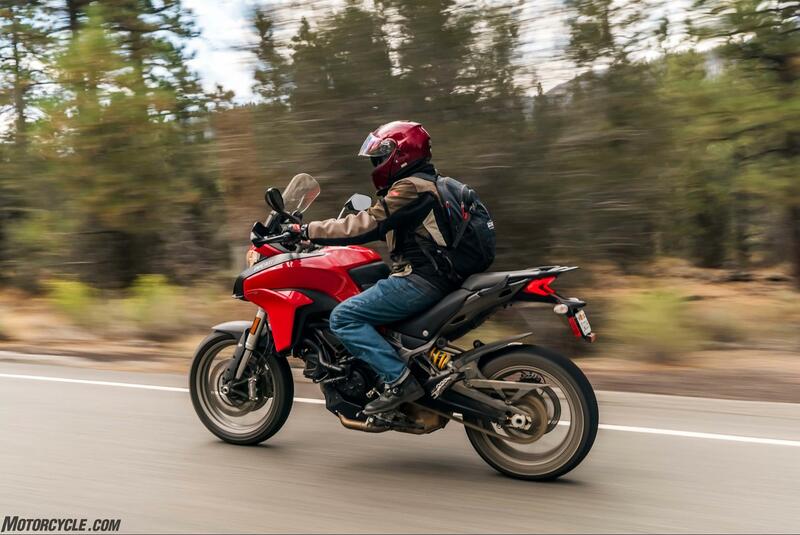 You can also cancel your front signals, literally, by banging the handguards they’re mounted upon into a limb or dropping the bike. Why do they put them there? Ryan Burns complained about the shifting right off the bat. We both looked down to inspect his footgear at the same time. A half-hour later, he was loving the Multi. Those about round out the complaints section. In the Things We Like category, we can start with my complaint in last week’s comparo about the fork being too soft in its first inch of travel: Five minutes with a 14mm socket dialing in two more lines of preload atop each 48mm fork tube, problem solved. There’s a knob right there under the seat to dial up the rear when you’re carrying stuff or a passenger. Electronic suspension is nice, but there’s still a lot to be said for simplicity. 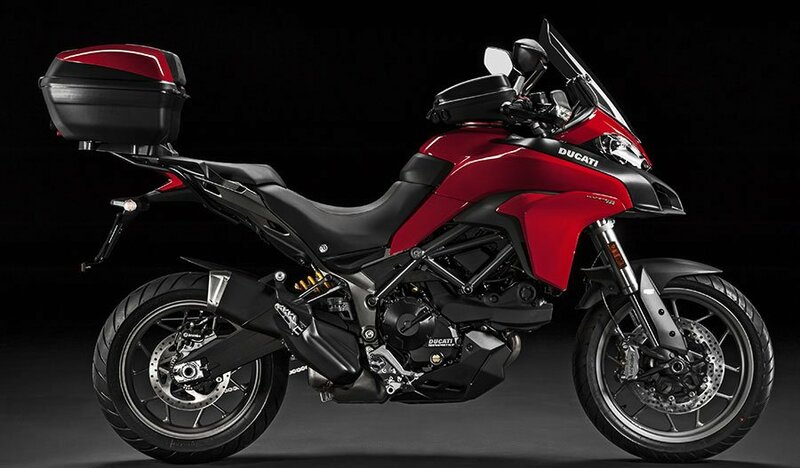 Once I stiffened the fork a bit, I am agreeing with Sean A.: This is a Ducati! 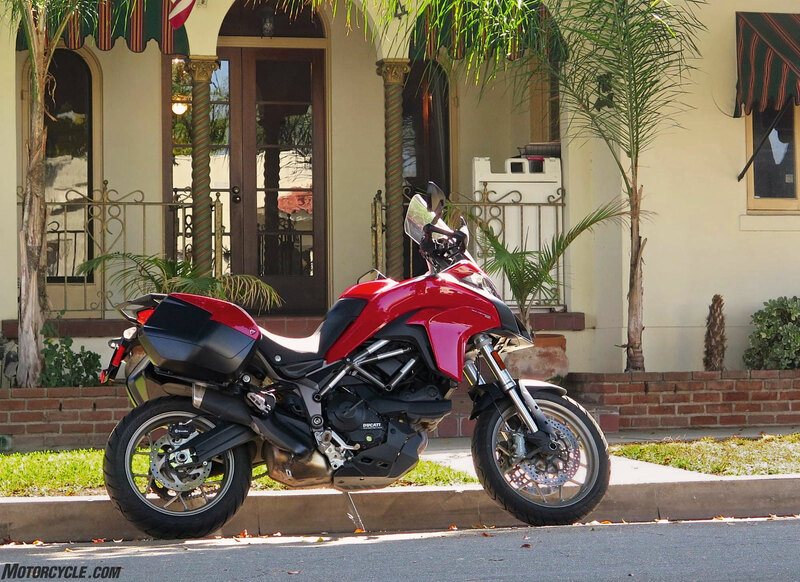 A sporty sportbike even if it’s an ADV one, even if it does have a 19-inch Pirelli Scorpion Trail II front tire. 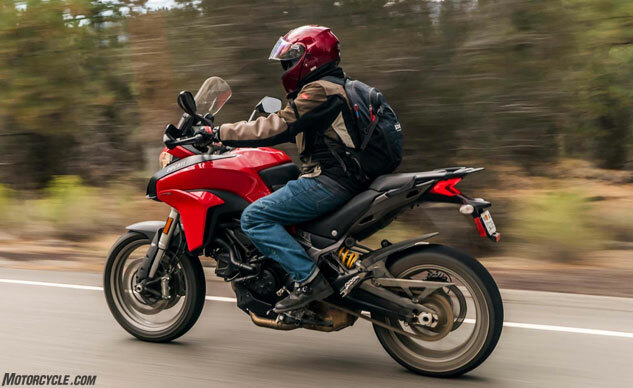 Speaking of carrying stuff, the optional hard bags are super-easy to attach and unattach from the bike – maybe too easy to unattach if you sideswipe something; the lugs that hold them on are pretty thin plastic – but the left one will swallow my Large Shoei Neotec. Passengers below about 140 pounds won’t complain much about their part of the seat, which is flat and surrounded by a cargo rack with good luggage attachment points. Under the back seat there’s a USB and a place for your phone, along with a 12V outlet, and another 12V socket under the instrument panel. The alternator puts out 500 watts. That little long black box at upper right tells you what mode you’re in. Can you read SPORT? 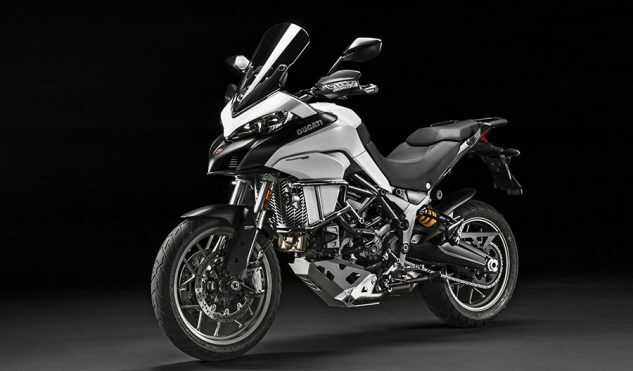 In the end, if the 950 isn’t the stately pleasure dome that the 1200 Multistrada is, it’s pretty damn close enough given the disparities in price tags. 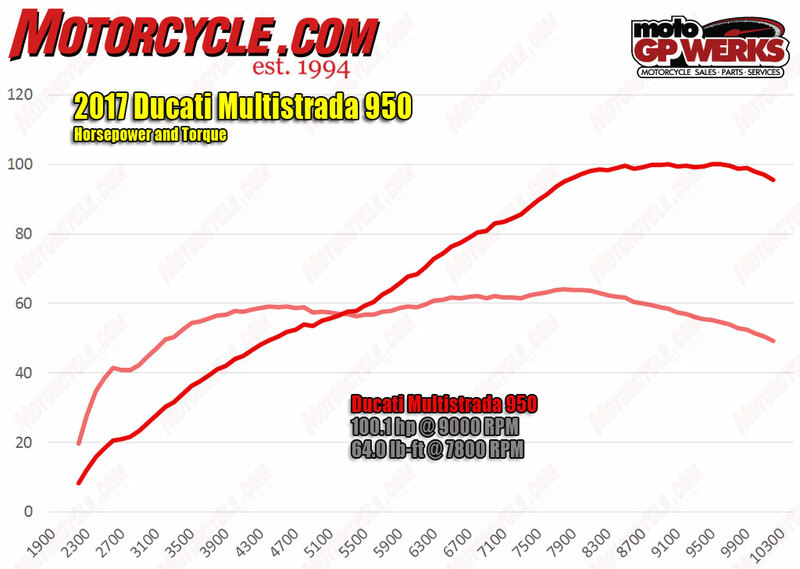 And the reduction in mass and complexity, some cheapskates would argue, makes the 950 a purer Ducati experience. And it’s the pure experience you need if this is your gateway Ducati, which is of course just what they’re hoping for in Bologna. Cool Accessory Packs are available for a few lire more, including the Enduro Pack (above) and the Urban Pack below. Despite its balky gearbox, despite its moderate engine heat, the more the mini-Multi hangs around, the more I enjoy hopping on it. Though the scales say it’s ten pounds heavier than the Suzuki V-Strom 1000 that won our comparo, the Ducati feels smaller, a tad nimbler, and heck, it’s a Ducati. People dig it. Oh. The biggest thing I got wrong in last week’s comparo was the price. 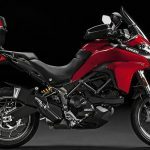 The Multi’s not $4 less than the V-Strom, it’s $996 more – $13,995. 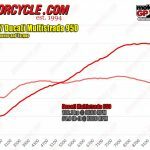 That’s still a tremendous chunk off the $20,295 Ducati wants for a Multi 1200 S (we’re checking now to see if you can get a base model 1200). For 69% of the price of the big Multi, I think you’re getting about 83% of the Ducati goodness. 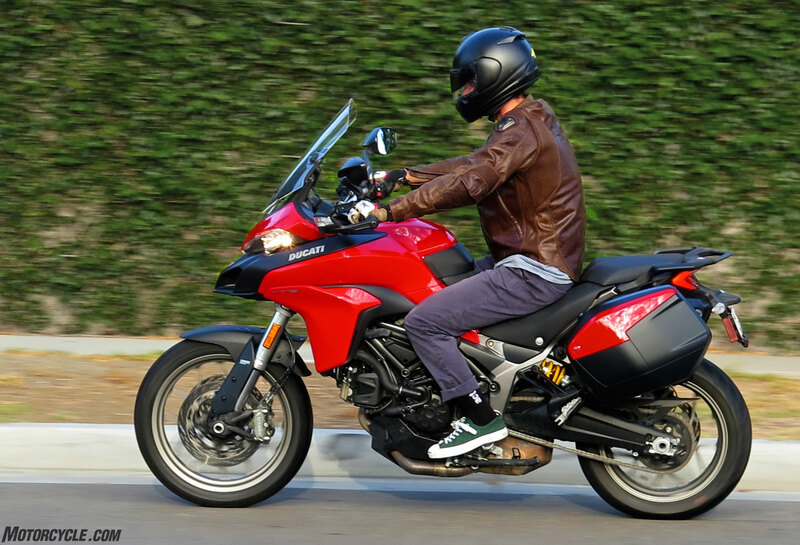 At MO, most of us would go with the Suzuki V-Strom, but if you just want a Ducati we definitely know the feeling, and would not try to talk you down. Valve Train DOHC, desmodromic; 4v/cyl.